A really charming tin toy this one. 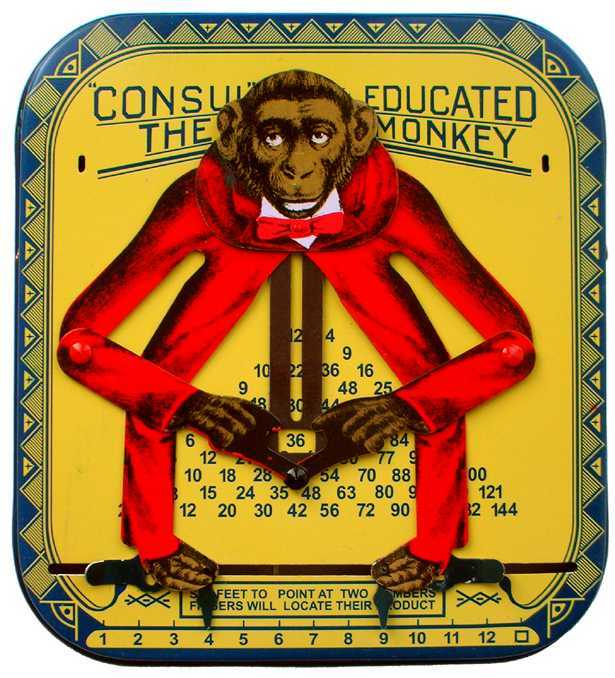 We like it a lot!The monkey is articulated, and when you set the feet to a particular combination of numbers, shown along the bottom of the tin, say '4' and '9', the 'Educated Monkey' multiplies them together and comes up with the answer '36' - as shown in the picture.Any combination of numbers from 1 to 12 can be multipied together, and although you can't point both feet to the same number, eg to multiply '5' by '5', there is a 'square' function, to allow you to work out 5 squared. So all in all, you can calculate anything from the '1' times table to the '12' times table, although you can't enter any number bigger than 12.This is a modern reproduction of a toy that was patented in 1916 by William Robertson of Belmont, Ohio. The original toy was manufactured in the US, and the antique versions are now quite expensive.Why is he called Consul? Well, a film producer called Charles Urban made a movie in 1909 called 'Consul Crosses the Atlantic'. Consul was a trained monkey of the time, well known in England and Europe. The 1909 film records Consul's first visit to the USA. So we would guess that this gave Mr Robertson the idea to call his calculating monkey 'Consul'.The base is about 14 x 15 cm, and there is a little wire stand at the back, so you can stand the toy up like a picture frame if you want. Consul comes in a presentation box. Who could fail to be charmed by this one? Fun item. Replica of and old tin toy / curio. Great gift for an accountant! (Not too precious and ewith a sense of humour). Very cute, very clever. Possibly my favorite. It amazed the children as well. This is brilliant, so good! It's lovely and it works, what more could you ask, every child should have one! Great present for a maths teacher! Slight tendency for the sliders to get stuck on each other, but perhaps this is part of the charm. Perfect for my daughter's maths teacher. Right every time!